to Register for Classes for Children! to Register for Classes for Adults! Our team of outstanding professional teaching artists focus on the process of creation and development of the artist. Through the generous support of our donors, our classes are kept affordable, enabling all members of our community to reap the benefits of first-rate instruction in a professional theatrical environment. Whether you are looking to bring your child to an arts program for the first time or looking to build upon your own craft as an artist, Luna is the home for you and your family to grow. If you have questions, please email info@lunastage.org or call our business office Tuesday, Thursday and Friday from 10am-3pm (summer hours) at 973-395-5551. 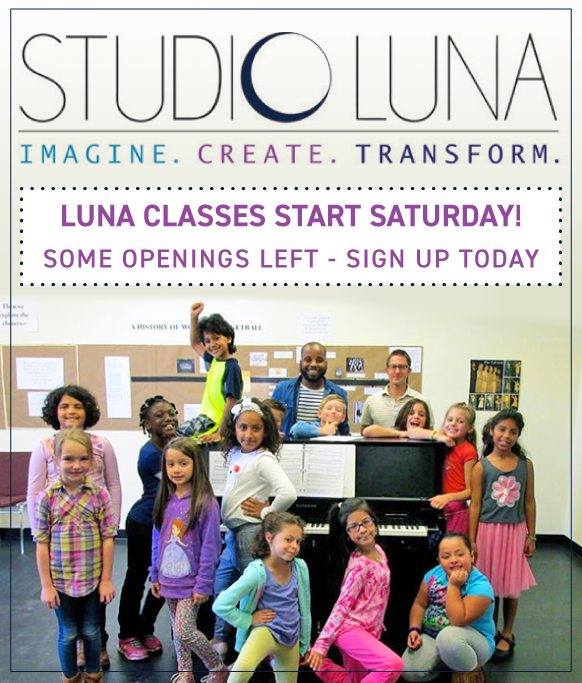 Luna's Song and Dance Class allows offers a fun introduction to musical theatre for our youngest artists. Children are introduced to all the different elements of musical theatre (acting, singing, dance and stage presence) and given the opportunity to discover their individual talents, creativity and self-expression. The class culminates in a sharing for family and friends. Luna's Musical Theatre Class allows children of all experience levels an opportunity to discover their individual talents, creativity and performing interests while exploring the basics of Musical Theatre (acting, singing and dance). Young performers work collaboratively to explore vocal technique, character-based song interpretation, and choreography from Broadway musicals. The class culminates in a sharing for family and friends. The class is specially designed with creative minds and play as the focus. Through the use of theatre games and mini-performance workshops, young actors receive a comprehensive study of the various aspects of acting and performing. Topics include voice and speech, character development, creative expression through movement and solo and group improv, just to name a few. Actors will have an opportunity to perform for each other every class, and will work together to develop self-confidence, team/group dynamic, body and spatial awareness. The class culminates in a sharing for family and friends. Young artists will have a blast learning how to think on their feet in this new class that incorporates scene work and movement-based and group exercises to explore the primary fundamentals of improvisation. Participants will gain self-confidence and improve their focus and listening skills. A great class for serious young acting students looking to improve their craft, and for beginners looking for a fun way to explore their creativity on stage. Take your acting skills to the next level with our Master Class. This class is designed for student actors with prior class room experience who wish to further explore the craft of acting through the use of monologues and scenes from contemporary and classic writers. Building on the principles introduced in our "Acting Essentials" class, emphasis is on character development and preparing for production. The goal of the class is that everyone achieves a deeper insight into their own unique knowledge of the acting experience and how they personally relate to it. The class will culminate in a presentation in Luna's Studio Theater with an invited audience. Students who have not taken our "Acting Essentials" Class must receive permission from the Instructor to register for the Master Class. You've never written a play before? No problem! For thousands of years, playwrights have been bringing people together to explore what it means to be part of a particular society. This unique playwriting class will stimulate novice writers who have an interest in how their words can affect and engage their community. This class begins with the basics of playwriting, exploring what it means to write a "civic play," and sampling multiple techniques for doing so. Playwrights will work on short plays outside of class, using class time to further develop their work. The class culminates in a public reading of these plays by professional actors on Luna's mainstage.